For me this bath melt reminds me a lot of Lush’s Christmas star melt, not the scent which is totally different, but the way it leaves my skin. Once it dissolves into the water completely it leaves behind lovely pink, soft, moisturising and scented water. My skin is left feeling really soft when I get out the bath. This melt is made up of 50% calamine powder which soothes skin, perfect for when my eczema's gone away but my skins feeling a bit irritated still. I love the smell! Delicious cherries mixed with sweet passion fruit, perfect! 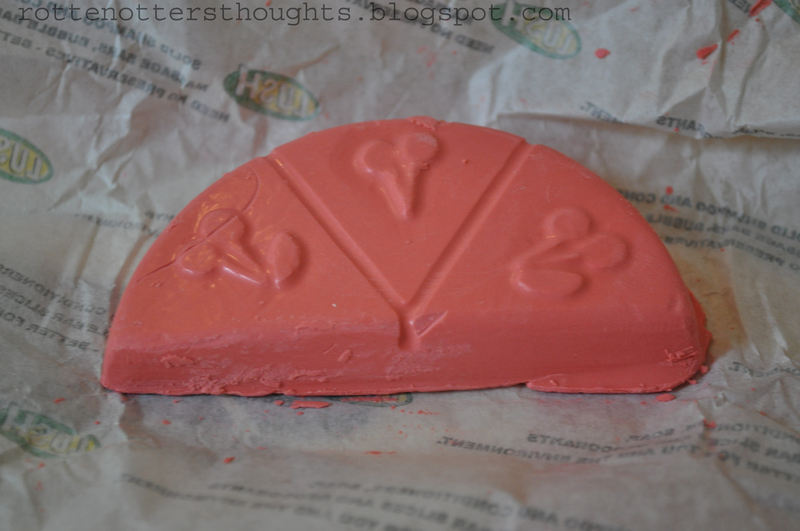 As you can see the bath melt is split into three so you get more baths out of what you paid for. Oh you got a lot of Lush products! Is it cheap there? Well, here in our country it's so expensivo! I don't think I'll buy it myself. @Simply effortless, They are expensive if you constantly buy them and that's all you use but for a treat every once in a while I don't think they're expensive.